Christmas is over, and now there is a lot of Christmas music on my Mac. Is there a way to disable or hide a genre or a category, rather than individual songs, from iTunes. Basically I don't want these to play at anytime, when shuffling, using genius or when playing down the alphabetical list. 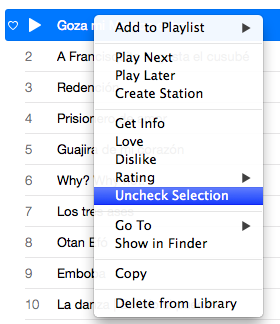 Checkboxes are universal, meaning that unchecking them in the library but checking them in a playlist can't happen. A song's box will all be checked or unchecked at a given time. However, this does let you make the act of checking/unchecking simple. If you have a Christmas playlist, or some sort of grouping in iTunes that has all the music you don't care about them, browse to that playlist, select all the tracks (cmda, right-click -> select all, however you wish to go about it), and then right click one of the tracks and click 'Uncheck Selection'. Massive amounts of tracks instantly unchecked and will not be considered for Genius, iTunes DJ, syncing, anything. You can simply uncheck the Checkbox next to the track. If unchecked, the song will never played! Create just two different iTunes Librarys. One with Christmas songs, and another for the rest of the year. When it's christmas time, open iTunes and hold down the [alt]-key, to choose the other library! Some views do not have checkboxes or they could be hidden. Just right click the track and select "Uncheck selection". Not the answer you're looking for? Browse other questions tagged itunes . Can I make an iTunes playlist comprised solely of songs that lack iTunes genius information? Is the iTunes Match Limit for ALL Songs or just Matched Songs? Can you export/capture the contents of a Genius Mix? How do I tell iTunes to NOT mark podcasts as “Skip when shuffling” by default? What do light grey song titles mean in iTunes?